There’s a long list of household items that can be toxic to pets: plants, laundry pods and chocolate being the most common enemies. But 50 percent of the calls to pet poison helplines actually involve mishaps with human medications. It can happen easily. A pet noses through a purse on the floor, plucking out a bottle of pills. The dog gnaws on an asthma inhaler, left on the bedside table. The cat flips open the lids on the weekly pill container or the dog thinks it’s a new chew toy. Sometimes, it’s human error that puts our pets in danger. Do you keep your own medications in the same cabinet with your pet’s pills? It’s easy to mix them up. And some owners may intentionally administer a human medication to a pet, assuming that it’s safe because it’s labeled for children or it’s sold over the counter at the drugstore. However the human medicine gets into the pet, it’s important to note that pets metabolize many of these medications differently than we do, sometimes with harmful — and even deadly — consequences. If you suspect that your pet has eaten any human medications, call your veterinarian or the 24-hour Pet Poison Helpline at 800-213-6680 immediately. Here are some of the human medications that could be most problematic in dogs and cats. These include non-steroidal anti-inflammatory drugs (NSAIDs) such as ibuprofen (Advil and some types of Motrin), naproxen (Aleve) and aspirin, as well as acetaminophen (Tylenol and Excedrin). Pets that eat large doses of NSAIDs can experience severe stomach ulcers and kidney failure. Signs may include vomiting (with or without blood), diarrhea, loss of appetite, lethargy, increased drinking and urination. A single, regular-strength tablet of acetaminophen can be fatal to cats. Poisoning by this substance in cats usually affects red blood cells, leading to difficulty breathing and swelling of the face and paws. In dogs, acetaminophen toxicity can lead to liver damage. This medication is also found in many human cold and flu products. Antidepressants are some of the most commonly used human prescription medications in the U.S., going by names such as Prozac, Celexa, Cymbalta, Lexapro, Paxil, Zoloft and Effexor. Pet overdoses of these medications can lead to sedation or the exact opposite, excitation. Pets may have tremors or seizures and may experience vomiting and diarrhea. Cats, especially, are attracted to the taste of Effexor, and just one pill can be dangerous. Stimulants such as amphetamines are often used to treat attention deficit hyperactivity disorder (ADHD), attention deficit disorder (ADD), weight loss and narcolepsy. The drugs go by names such as Adderall, Dexedrine, Concerta, Ritalin and Vyvanse. Illegal forms of these drugs include methamphetamines, crystal meth and ecstasy. In dogs and cats, even small amounts of these medications can lead to seizures, panting, heart problems, vomiting and diarrhea. While many of these medications are used in both human and veterinary medicine to treat heart failure or blood pressure problems, in certain doses, they can be toxic to pets. Beta blockers such as Coreg, Sectral, Toprol and Tenormin can lower heart rate and blood pressure to dangerous levels. ACE (angiotensin-converting enzyme) inhibitors such as Altace, Lotensin, Prinivil, Vasotec and Zestril are generally safer unless the pet has heart or kidney disease. But high doses can cause low blood pressure and dizziness in pets. These include drugs such as Ambien, Lunesta, Ativan, Klonopin, Restoril, Valium and Xanax. Drugs that cause sedation in people can do the same in pets — or have the opposite effect. Up to 50 percent of dogs that eat toxic doses of sleep medications actually experienced panting, hyperactivity and tremors. At high doses, some of these drugs can cause liver damage in cats. Because these inhalers often contain 200 human-sized doses, a dog who punctures the canister when chewing on one can be subject to a huge overdose. Signs may include a racing heart rate, vomiting and collapse. Always place purses, backpacks and other totes that contain medications out of your pet’s reach. The same goes for weekly pill containers or plastic bags containing pills— don’t leave them on counters where pets can access them. Store human medications separately from your pet’s medications to avoid unintentional mix-ups. 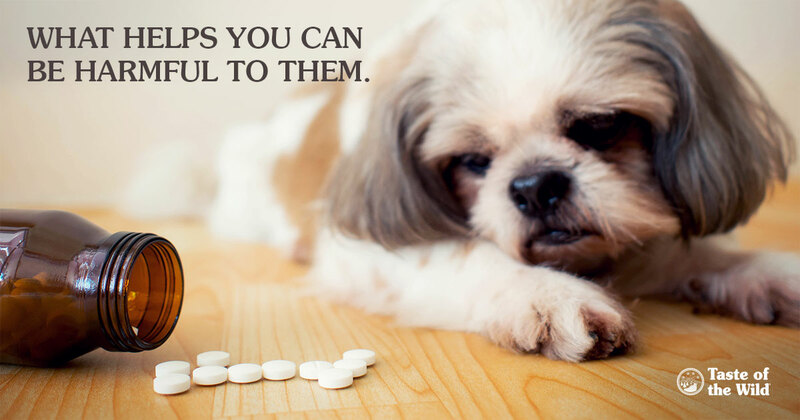 Take medications in a separate room from your pet so he or she can’t snap up any pills inadvertently dropped on the floor. Never administer any human medication to a pet unless your veterinarian advises you to do so. Again, if you suspect that your pet has eaten any human medications, call your veterinarian or the 24-hour Pet Poison Helpline at 800-213-6680 immediately.